Background: Optical access trocar (OAT) for primary access has been shown to be safe for obese and non-obese patients. Visualization of the abdominal layers is thought to help reduce the risk of injury to intra-abdominal organs. Concern still exists about the use of an OAT in obese patients with prior abdominal operations (PAO). We retrospectively analyzed our experience with optical access trocars in patients with PAO undergoing laparoscopic Roux-en-Y gastric bypass (LRYGB) surgery. Methods: We identified 391 LRYGB operations performed by two surgeons at one academic center over a 7-year period. All patients met NIH criteria for weight loss surgery. PAO were recorded during preoperative evaluation. A 10mm Optiview (Ethicon, Somerville, NJ) trocar was used in all cases. Operative notes were reviewed. Complications were defined as injury to abdominal or retroperitoneal structures upon entry into the peritoneal cavity or failure to achieve peritoneal access with the OAT. There was no risk stratification or randomization of patients based on the type (laparoscopic vs. open) and extent (major vs. minor) of PAO. Patients that had only a prior tubal ligation were not included in the PAO group. Results: The majority of patients (n = 255, 65.2%) had a PAO. Of these, 117 patients (30.0%) had one; 76 patients (19.4%) had 2; 44 patients (11.3%) had 3; and 18 patients (4.5%) had greater than or equal to 4 PAO. There were 136 patients (34.8%) with no PAO. There were four operative complications associated with use of the OAT (overall complication rate = 1.02%). All complications occurred in patients with only one PAO (1 C-section; 2 open cholecystectomy; 1 laparoscopic cholecystectomy). There were three minor complications (0.75%) where the OAT failed to gain peritoneal access and the Veress needle or Hasson cannula were utilized. There was one major complication (0.26%) where a transverse colotomy was made with the OAT. There were no other vascular or visceral injuries. Conclusion: These data suggest that OAT use for peritoneal access in a morbidly obese population with PAO has an overall complication rate lower than the reported use of Veress needle or Hasson techniques. 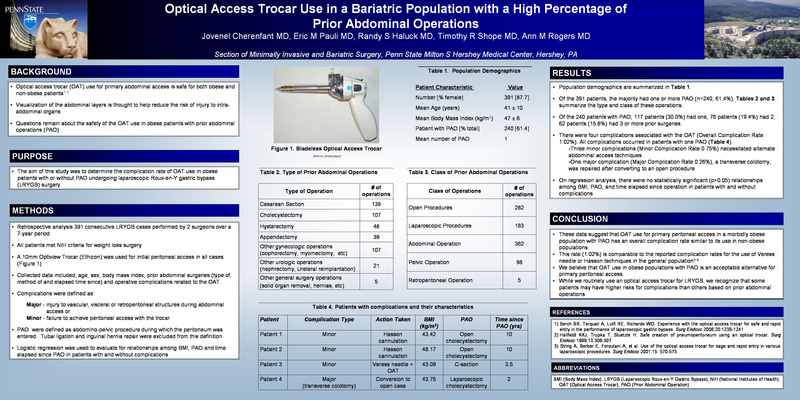 While we routinely use an optical access trocar for LRYGB, we recognize that some patients may have higher risks for complications than others based on prior abdominal operations.